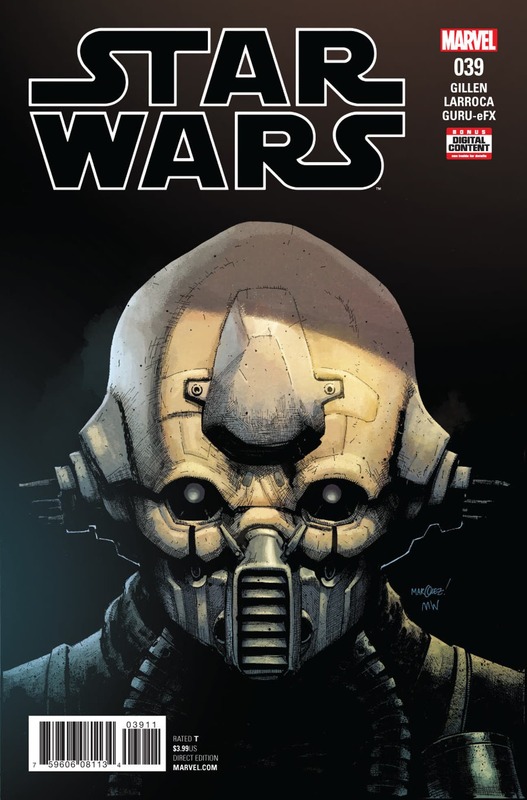 The Rebels get friendly with the Partisans in Star Wars #39. After dodging a death sentence with Saw Gerrera’s second in command, they volunteer to help them out on Jedha. Meanwhile the Empire launches a drill citadel to plunder the kyber crystals hidden in Saw’s old lair. There’s a lot of dialog in this one, with a little action, but it does move things along and build up some of the character relationships. The issue opens with Luke, Leia and Han bartering for their lives. Benthic, Saw’s second in command and the current leader of the remaining partisans, is swayed by Leia’s promise of much needed supplies. Interestingly enough, Leia vouches the support of the Rebel Alliance with no strings attached. This leads one to wonder why? On one hand, Saw is dead, so perhaps Mon Mothma’s real beef was with Saw himself. With the losses after the battle of Scarif and Yavin, the Rebellion may not be in a position to hold the high moral ground. Gillen opens up that discussion without delving into the motivations. Even Luke, who balked when he heard that the Partisans openly attacked civilians, changed his mind when he saw how ruthless the Empire was being on Jedha. There’s a bit more to the Rebels and Partisans storyline as they do a quick trip to Jedha and back, but secondary story thread is dominated by the Imperials. Queen Trios and Commander Kanchar get very chummy as they continue their mission to mine Jedha for the remaining kyber crystals. Kanchar reveals that Saw was very successful in disrupting the previous efforts, and that he had a large cache in his citadel. With Queen Trios’ expertise in mining and her specialized miners and equipment, they’re set to get all that kyber back. The two work well together but I’m not sure what kind of future there will be for them when they’re up against Han, Luke and Leia. Are they doomed to die or will they somehow live on to be a menace in the future? All in all the story is interesting, and it’s not too bad with the artwork. Larroca’s flair for photo realistic faces kind of stands out in a bad way in this issue, especially with the lighting and the contrast between the textures. It hurts the overall look of the comic. That aside, the artwork does a good job with everything else. With decent artwork and an interesting story, I give Star Wars #39 a four out of five metal bikinis.